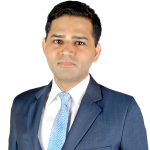 Vaibhav Malik is director of BGA’s India office. In this role, he develops strategies for clients, manages projects and undertakes business development. Vaibhav previously worked as a business consultant and has almost a decade of experience of working with companies across various sectors. He started his career in investment banking before transitioning to management consulting for companies in aerospace and defense, automotive, education, financial services and telecommunication. Vaibhav has worked at companies such as Standard Chartered Bank, JP Morgan Chase & Co and Roland Berger Strategy Consultants. Prior to joining BGA, he was managing aerospace and defense clients for the U.S. Chamber of Commerce in India. In that role, he engaged key stakeholders through the U.S.-India Business Council (USIBC) and developed and executed strategies for clients to grow their businesses in India. He organized multiple trade missions, ensuring that his clients use the USIBC effectively to work with regulators, policy experts and civil society actors. Vaibhav studied finance at the University of Toronto and holds an MBA from the Rotman School of Management in Canada. He currently resides in New Delhi with his wife and son.